When the keyboard is displayed,push to hide keyboard. When the keyboard is non-displayed,push to lock/unlock the direction of the screen. Which page of 1-5 the previous figure is is displayed from the colon. When the content of the file is changed, "*" is displayed. When searching string, this place becomes the next searching button. The content editing it now is annulled, and it becomes a new text screen. It moves to the file loading screen. It moves to the file saving screen. It moves to the line the under the text. The tap does the clock display area to the uppermost line movement. The search textarea is displayed in the title bar. It returns to the origin when pushing again. The displayed font size is enlarged. The displayed font size is reduced. The content of the text being displayed now is assumed to be a text and the mail application program is started. The content of the text being displayed now is interpreted as HTML. It returns to the origin when pushing again. (1)Return to the text editing screen. Move to all file text searching screen. The file below the folder being displayed now becomes an object. The included number of folders/files is displayed for the folder. 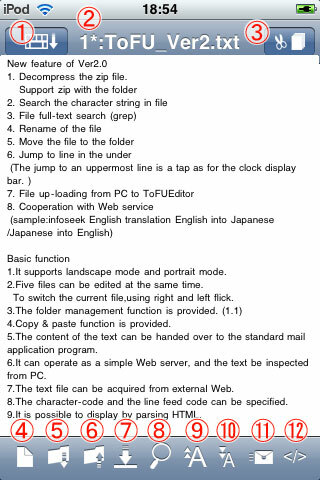 the content of the file head text is displayed for the file. It moves to the folder for the folder when selecting it. The file is opened at the file. Unzip at the zip file. It is possible to delete it by swipng file name/folder name. The open file is displayed with the color. The page where the text is opened without newly opening when this file is selected is displayed. Move to the parents folder. The folder making dialog is displayed. It becomes a file name change mode. It returns to the ordinary mode when the button is pushed again. When file/folder is selected in this mode, file name/folder name change dialog is displayed. It becomes a folder move mode. It returns to the ordinary mode when the button is pushed again. When file/folder is selected in this mode, it becomes a moving destination folder selection mode. When the move destination folder is selected, file/folder is moved. The file is get from the Internet specifying URL. It is displayed as an initial value when there is a content that starts from "http://" in the clipboard. The sequential number is added(_1 ,_2...) without doing the superscription for the file name where the acquisition file already exists. It moves to the simple Web server start screen. Move to a preference screen. (1) Return to the text editing screen. The character-code and the line feed code are specified. 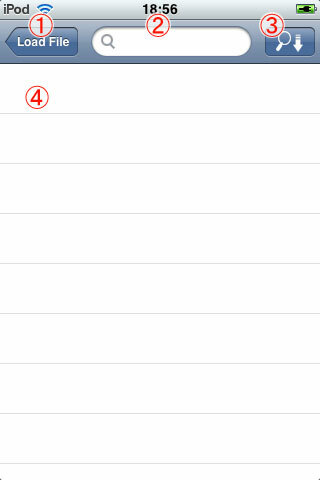 (5) A current folder is displayed. It is saved to this folder. (6) The folder is displayed. It moves to the folder when selecting it. (7) The file is displayed in the gray. It is not possible to select it. (1) Return to the load file screen. The search result is displayed. The file is opened when selecting it. (2) Effective/invalidity of the line selection by a triple tap is set. (3) Effective/invalidity of the line selection by two finger tap is specified. (4) A screen monochrome reversing is set. (5) Effective/invalidity of the display with the color of the retrieval result is set. - Time hangs in the retrieval result display when it is a big file when displaying and doing effectively with the color. (6) "*.html" It is set whether to do HTML Perth automatically when the file is opened. (7) The Web service synchronization is set. It moves to a Web services screen when pushing. (1) Return to the preference screen. (5)(6)The range enclosed with StartString and EndString is acquired. Safari : Please input as "tofueditor" at Safari URL to start ToFU Editor. 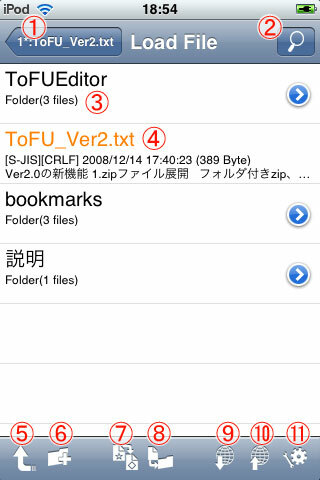 Other Application : OpenURL "tofueditor". 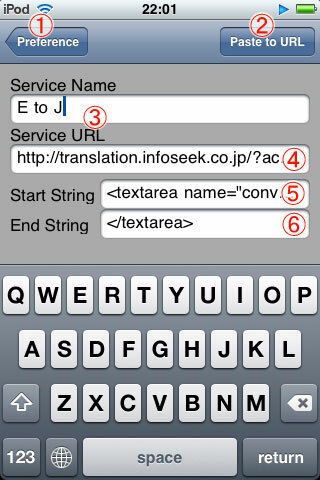 A simple Web server is automatically started..
from iPhone/iPod touch ->■Click Here ,the editor starts when waiting for one second, and, in addition, a simple Web server starts. 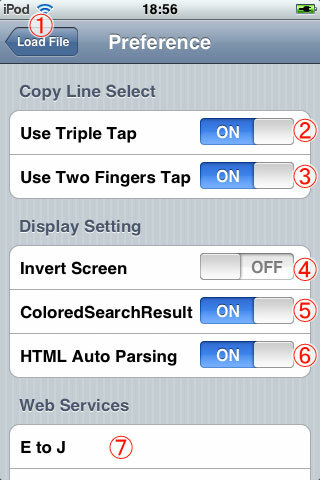 from iPhone/iPod touch ->■Click Here ,the editor starts with clipboard "YouCanCopy." URL can be copied by using the bookmarklet. Contents can be copied by using the bookmarklet. It is an example of registering service. If copy & paste is done here, it is possible to use it. When this page is acquired with HTML when copy & paste is done directly from iPhone, it doesn't operate well. It is the one in an initial value with.